as my dog and I walked by. “Where are they going?” my dog did ask. “To the moon,” was my reply. when the ravens appeared in the sky. as they flew in small groups up so high. then turned to go down the main street. ne’er before had we seen such a treat! 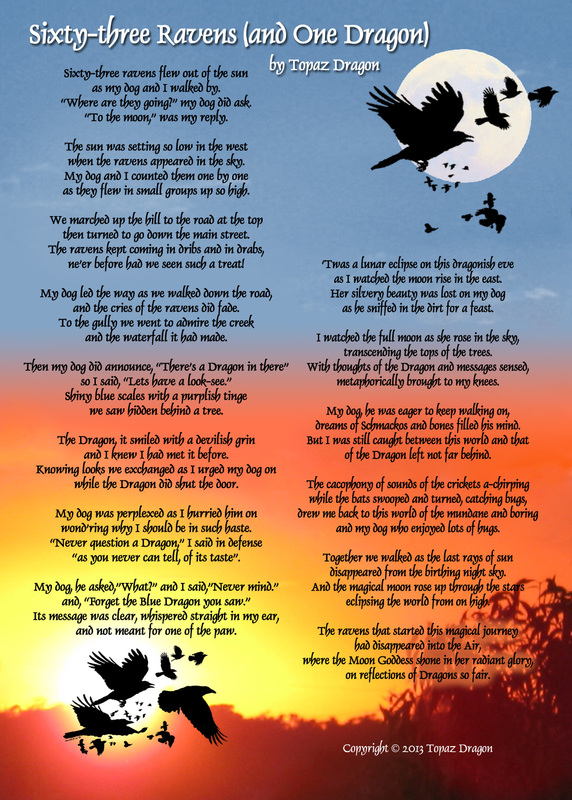 and the cries of the ravens did fade. and the waterfall it had made. we saw hidden behind a tree. and I knew I had met it before. while the Dragon did shut the door. wond’ring why I should be in such haste. “as you never can tell, of its taste”. and not meant for one of the paw. as I watched the moon rise in the east. as he sniffed in the dirt for a feast. transcending the tops of the trees. metaphorically brought to my knees. dreams of Schmackos and bones filled his mind. of the Dragon left not far behind. and my dog who enjoyed lots of hugs. disappeared from the birthing night sky. eclipsing the world from on high. on reflections of Dragons so fair. This entry was posted in Poetry and tagged 63 ravens, Dragon poetry, full moon, lunar eclipse, poetry, ravens, sixtythree ravens.